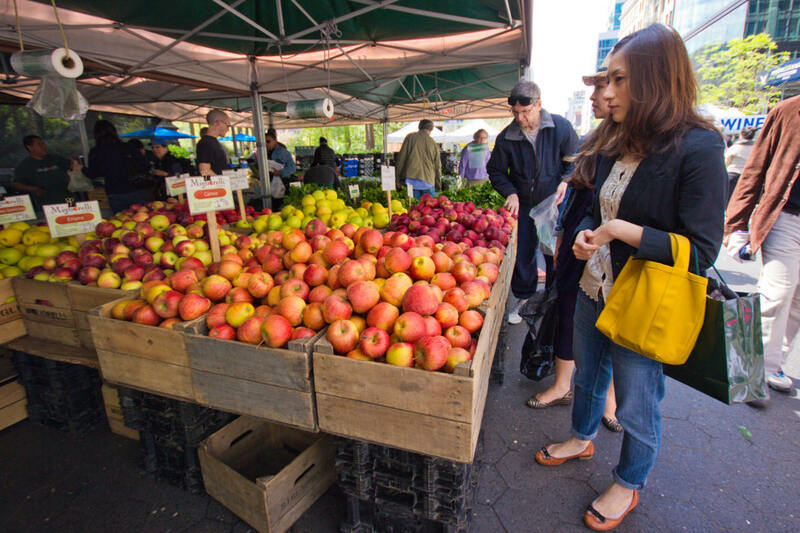 Which Farmers Market is The Best? Which Farmers Market is The Best in the Country? It depends on which ranking system you choose. We navigate them for you. On the unofficial side, we have Yelp. Users here aren’t shy in sharing their opinions; the site has racked up more than 83 million reviews since 2004, and there are thousands of farmers markets reviewed on the site. Type in your city, and your chances are good to find valuable information – like which market has the most variety or which has the best live music. What a simple search won’t do is get you a list of “the best” in a broader area. Yelp searches by city. To get statewide or countrywide data, you’ve got to reach out to their data team. “You’ll notice that some markets with lower star ratings are listed above markets with slightly higher ratings. This is because we take both the number of reviews and star rating into account when pulling ‘Best Of’ lists,” explains Kayleigh Winslow, a Yelp representative who deserves a shout-out for digging up this info when the flight she was on was about to land. Although each part of the above list is classified as a farmers market in the site’s search engine, closer scrutiny reveals that many are, in fact, restaurants and small shops selling local goods rather than farmers markets as we know them in the series-of-stalls, face-time-with-the-farmer sense of the word. For the last seven years, American Farmland Trust (AFT) has run a market ranking system called the Farmers Market Celebration. According to Marketing and Communications Director Laura Trivers, the Celebration is set up to get the public engaged in issues related to family farmers. “Markets are an important source of income for many family farmers. Each summer, we run this Celebration to promote farmers markets – and therefore, support farmers,” says Trivers. “Real people vote for their markets; we spread the word through market managers and our social media accounts,” she says. Between June 21 and September 23, people rate their farmers markets in five different categories including People’s Choice, Focus on Farmers, Healthy Food for All, Pillar of the Community, and Champion for the Environment. Ranking parameters set the Farmers Market Celebration apart from Yelp, which although more widely known about and used, essentially ranks on page activity. At this point, the highest-ranked markets are all relatively small and in relatively small cities. 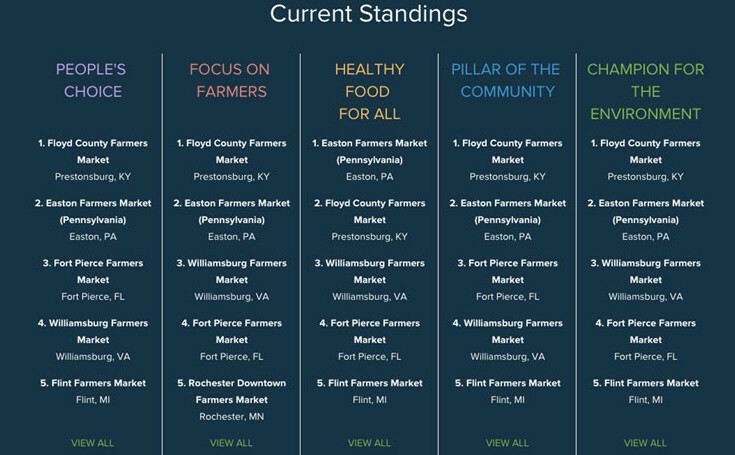 The two markets dominating the numbers one and two spots across the board – the Easton Farmers Market in Easton, PA and the Floyd Country Farmers Market in Prestonsburg, KY – have 41 and 10 vendors respectively. Markets like the Union Square Greenmarket in New York City (with 140 vendors) and the Santa Monica Farmers Market (with 113 vendors) dwarf them, yet they don’t appear anywhere in the top 50. Connelly says that all USDA-registered farmers markets are eligible for nomination. As of last week, nearly 10,000 votes have been cast, and you still have a little more than a month to lock your favorite farmers market in the top 50, an accolade that earns goodies like a “Best in Class” flag to hang at the market, lapel pins for the vendors, and bragging rights to use in their promotional materials. Ralph Davis, who manages the nine-or-ten-vendor-deep Floyd County Farmers Market, is happy for its recognition. “We are very fortunate to have strong support from our community. We have dedicated supporters who are very passionate about and committed to supporting local foods,” he says. Floyd County Farmers Market has also been voted Kentucky’s favorite farmers market for two years running, according to Davis. 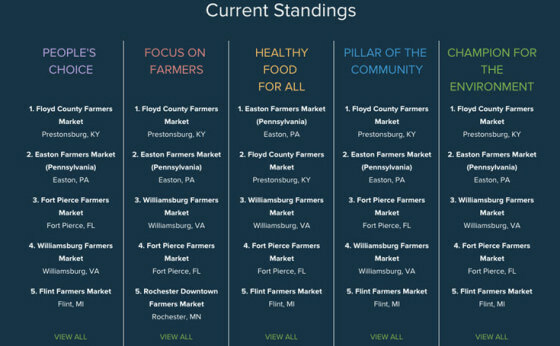 A highly comprehensive ranking is the 101 Best Farmers Markets in the US list released for the past few years by The Daily Meal, written by Abbey Caine but researched ad nauseum for two months prior, using info gathered by the editorial team and the Fresh Nation Farmers Market widget, which allows readers to contribute their recommendations by searching ZIP codes and clicking the heart button next to the market name. While California dominated the top of the Yelp list and “little guys” dominated the top of AFT’s, Minneapolis had the most appearances on The Daily Meal‘s. “I was surprised by all of the markets [from there] that made it to our final list from. I tried to proportionately add markets to be ranked from all over, but Minneapolis definitely had the most to make it to the list,” says Crain. Regardless of where you gather your information, family farmers with farmers market presence are 10 percent more likely to stay afloat financially than farmers who do not, according to AFT. Farmers market patrons save an average of 25 percent more on food annually than grocery store shoppers. To top it off, businesses in close proximity to farmers markets rake in higher profits on market days, supporting the local economy. In essence, it’s a win-win (or a win-win-win). However, AFT reports that 50 acres of farmland are lost to poorly-planned development every hour. So in the end, how you choose your favorite farmers market doesn’t really matter. But it matters than you go. Honor thy local farmers – they need you.